Posted on January 18, 2019. Filed under Association News. Be the first to comment. ADFIAP met recently with the Philippine Climate Change Commission (CCC) regarding their partnership with the United Nations’s Economic and Social Commission for Asia and the Pacific (UN-ESCAP) for the project, “Mainstreaming Sustainable Climate Action within Financial Institutions in the Philippines” where ADFIAP, through its consulting group, is the implementing entity. 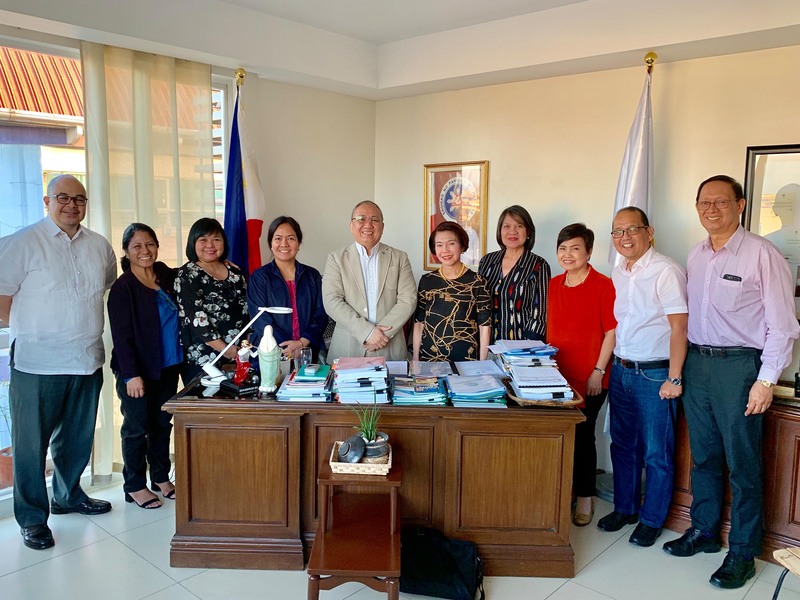 ADFIAP Consulting’s Cora D. Conde, Group Head; Albert B. Reyno, Managing Principal; Victor C. Abainza, Senior Consultant; Arlene S. Orencia, Head of Projects and Programmes; and Cristy T. Aquino, Head of Business Development met with Secretary Emmanuel M. de Guzman, Vice-Chairperson and Executive Director of CCC. Other attendees from the CCC side were Assistant Secretary Rommel Cuenca, Josie Ramos, Head of Climate Finance Systems Division and Services, and Gemma Cunanan, Head of Foreign-Assisted Program Management Systems Division. The project builds on the network of stakeholders established by UN-ESCAP and CCC through ADFIAP to promote green finance and raise awareness amongst stakeholders on the opportunities that green finance has to offer and to re-orient the financial sector towards low-carbon and climate-resilient investments in the Philippines. Actions towards this end include: (a) establishing a coherent capacity-building agenda for green financing to build immediate capacity within financial institutions to embed green finance into their lending operations; (b) engaging the Bangko Sentral ng Pilipinas (Central Bank) to lead in “greening the financial sector”; (c) signing of a charter by financial institutions that will serve as voluntary, non-binding and aspirational guidelines to move forward in the process of adapting to and promoting climate smart development; (d) launching of the “Climate Leadership Awards in the Banking Sector”; and (d) establishing a mobile-friendly virtual community of all constituents of the green finance ecosystem that will serve as a platform for sharing knowledge, dissemination of best practices, and opportunities for climate investments. The above activities will be phased into similar climate initiatives of CCC such as the building of a “Climate Investment Network” which was launched last December 17, 2018 with the signing by sustainable development stakeholders on a commitment board to support CCC’s whole-of-government climate actions towards a green economy and low-carbon future. While this project is initially for Philippine financial institutions (FIs), steps are now being taken to replicate the same in other countries where ADFIAP has member-DFIs.